Cellular Internet of Things: Technologies, Standards and Performance gives insight into the recent work performed by the 3rd Generation Partnership Project (3GPP) to develop systems for the Cellular Internet of Things. It presents both the design of the new Narrowband Internet of Things (NB-IoT) technology and how GSM and LTE have evolved to provide Cellular Internet of Things services. The criteria used for the design and objectives of the standardization work are explained, and the technical details and performance of each technology is presented. This book discusses the overall competitive landscape for providing wireless connectivity, also introducing the most promising technologies in the market. 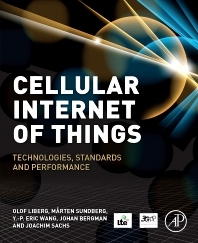 Users will learn how cellular systems work and how they can be designed to cater to challenging new requirements that are emerging in the telecom industry, what the physical layers and procedures in idle and connected mode look like in EC-GSM-IoT, LTE-M, and NB-IoT, and what the expected performance of these new systems is in terms of expected coverage, battery lifetime, data throughput, access delay time and device cost. How cellular systems work, and how they can be designed to cater for challenging new requirements emerging in the telecom industry. How the physical layers and the procedures in idle and connected mode look like in EC-GSM-IoT, LTE-M, and NB-IoT. What the expected performance of these new systems is in terms of expected coverage, battery lifetime, data throughput, access delay time, and device cost. How the Low-Power-Wide-Area IoT market segment looks like and how different available solutions compare in terms of performance and compatibility with already existing radio networks. What system capacity and network level performance can be achieved when deploying these new systems, and in addition what deployment options are possible. Learning outcome: After reading this chapter, the reader will understand the performance and limitations of eMTC. Olof Liberg is a Master Researcher at Ericsson Business Unit Networks. After studies in Sweden, USA, Germany, and Switzerland, he received a bachelor’s degree in Business and Economics and a master’s degree in Engineering Physics, both from Uppsala University. He joined Ericsson in 2008 and has in recent years specialized in the design and standardization of cellular systems for machine-type communications and Internet of Things. He has, over the years, actively contributed to the work in several standardization bodies such as 3GPP, ETSI and the Multefire Alliance. He was the chairman of 3GPP TSG GERAN and its Working Group 1, during the 3GPP study on new radio access technologies for Internet of Things leading up to the specification of EC GSM IoT and NB IoT. Mårten Sundberg is a researcher at Ericsson Business Unit Networks, with a previous position as a Senior Specialist in GSM radio access technology. He joined Ericsson in 2005 after receiving his master’s degree in Engineering Physics from Uppsala University. As Rapporteur of the 3GPP Work Item on EC-GSM-IoT he was leading the technical work to standardize the new GSM-based feature dedicated for Internet of Things. In 2016, he started leading the work towards URLLC for LTE, being a Rapporteur for the Work Item introducing shortened TTI and shorter processing times. Apart from being active in the 3GPP standardization body, Mårten has also worked for many years in ETSI, harmonizing radio requirements in Europe. Y.-P. Eric Wang is a Principal Researcher at Ericsson Research. He holds a PhD degree in electrical engineering from the University of Michigan, Ann Arbor. In 2001 and 2002, he was a member of the executive committee of the IEEE Vehicular Technology Society and served as the society’s Secretary. Dr. Wang was an Associate Editor of the IEEE Transactions on Vehicular Technology from 2003 to 2007. He is a technical leader in Ericsson Research in the area of Internet of Things (IoT) connectivity. Dr. Wang was a corecipient of Ericsson’s Inventors of the Year award in 2006. He has contributed to more than 150 US patents and more than 50 IEEE articles. Johan Bergman is a Master Researcher at Ericsson Business Unit Networks. He received his master’s degree in Engineering Physics from Chalmers University of Technology in Sweden. He joined Ericsson in 1997, initially working with baseband receiver algorithm design for 3G cellular systems. Since 2005, he has been working with 3G/4G physical layer standardization in 3GPP TSG RAN Working Group 1. As Rapporteur of the 3GPP TSG RAN Work Items on LTE for machine-type communications (MTC) in Releases 13, 14, 15, and 16, he has led the technical work to standardize the new LTE-based features dedicated for Internet of Things. He was a corecipient of Ericsson’s Inventor of the Year award for 2017. Joachim Sachs is a Principal Researcher at Ericsson Research. After studies in Germany, Norway, France and Scotland he received a diploma degree in electrical engineering from Aachen University (RWTH), Germany, and a PhD degree from the Technical University of Berlin. He joined Ericsson in 1997 and has worked on a variety of topics in the area of wireless communication systems, and has contributed to the standardization of 3G, 4G and 5G. Since 1995 he has been active in the IEEE and the German VDE Information Technology Society (ITG), where he is currently co-chair of the technical committee on communication networks. In 2009 he was a visiting scholar at Stanford University, USA. If you're an OEM developing new products that work on cellular technologies this is a must read.. with advent of LPWAN, new use cases are now possible, which open up tremendous opportunities.